Holiday gift plants play a major role in sharing life and beauty especially at Christmas time. They lift our spirits and make us feel good. It is a part of our gift-giving heritage and a way to express our love and appreciation through nature. In addition to living plants, there many wonderful gardening gifts to help you care for them. Potted flowers make wonder gifts which are good for the indoor environment. They are natural air cleaners which means cleaner air that is beneficial for the whole family. Chrysanthemums are given for Thanksgiving, the beginning of the festive season. The bright blooms of the chrysanthemum come in a variety of vivid colors that represent the autumn harvest. It warms our hearts with thoughts of freedom and bountiful blessings. It is a great way to celebrate and give thanks. Christmas is the season to be jolly, so decorate your home with live plants that give off a rainbow of brilliantly colored blooms. Display them on tables, on the mantle, fill an empty firebox with poinsettias, or make a beautiful focal point in an entryway to greet your guests. With proper care they will continue to give and give by producing year after year. The Christmas poinsettia all decorated with foil and ribbons is the traditional flower for the season. There are new varieties which also come in white, pink, yellow, lime green or bi-colors; however, the bright red is the traditional for the season. It is the perfect live potted plant to accentuate the home with cheerfulness and color for that festive touch. The tropical Christmas cactus blooms around Christmas time. This pretty winter plant produces tubular flowers that grow on pendulous stems. It comes in a variety of colors such as red, white, rose, and purple. It is an easy way to add Christmas accents to home. It is easy to care for, but must have special attention to get it to bloom. With proper care, this plant can be passed down from one generation to the next. 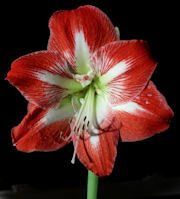 The amaryllis is a beautiful indoor winter-blooming present that will bloom year after year. 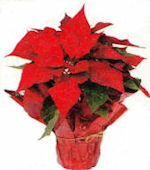 It comes in many colors, but the bright Christmas-red flowers make a more festive display. It is grown from a bulb and comes in single and double blooms. One word of caution: This plant is harmful to humans and pets if eaten or contact of the sap is made with the skin. are Holiday gift plants always appropriate gardening gifts.